Enjoy Gensokyo Radio in an all new way. 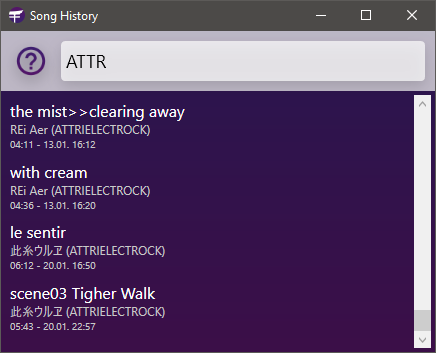 Keep track of every song being played. 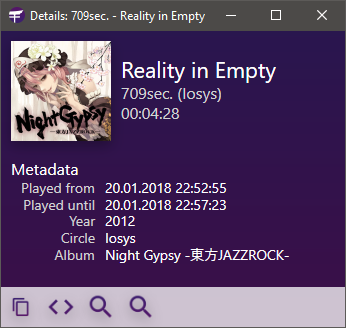 Lunatic Player stores everything including metadata and cover images. Never worry about finding that specific song again. Using the data provided by Gensokyo Radio, Lunatic Player provides extensive metadata for your consumption. Easily export track information to JSON or look up more with quick links to Google and TouhouWiki. Any support for Linux (macOS)? Development of Lunatic Player isn't focused on other platforms than Windows (currently). 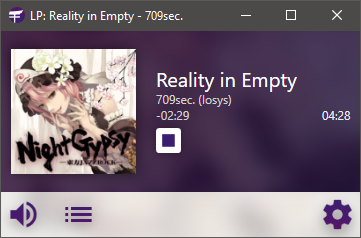 You should check out Tom's GensokyoRadio.net Receiver instead, which runs almost everywhere. I'd like to have feature x implemented. While I love working on Lunatic Player, it's just a side project and merely a hobby. You can add an issue at the GitHub repository and I'll consider implementing it.